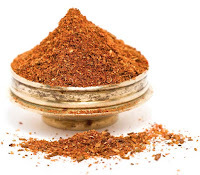 Ras el hanout is a North African spice mixture that it is central to Moroccan cuisine. 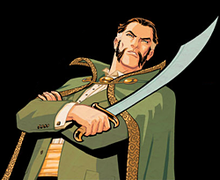 It is not to be confused with Ra's al Ghul, who is a Batman supervillain. In Arabic, ras el hanout means "head of the shop," signifying that it is the best spice mix the seller has to offer. It can sometimes contain 30 or more ingredients, but most recipes include cardamom, nutmeg, anise, mace, cinnamon, ginger, peppers and turmeric. Premixed ras el hanout can be found at many health food stores and well-stocked groceries, though a quick Web search will find several recipes for those who want to make their own batch. Ras el hanout is most commonly used in tajines, which are a form of stew named for the earthenware pot they are cooked in. This recipe, ras el hanout eggplant with chickpeas, is sort of a cousin to a tajine. It also bears a certain similarity to an Afghani dish called bonjan, which used cinnamon and mint instead of ras el hanout and does not include chickpeas. Preheat the oil in a large pot on medium-high heat. Add the onion and sauté until it is soft. Toss in the garlic and eggplant and stir for a couple of minutes. Add the tomatoes, chickpeas, and ras el hanout, cover, lower the heat to low, and cook for until the eggplants are soft, about 20 minutes give or take. Be sure to give everything a stir every so often, and add water or broth in small increments if the ingredients start sticking to the pot. Once the eggplant is soft and cooked through, the dish is done. Salt and pepper to taste. Serve over rice (jasmine or basmati work especially well), with pita, or go for the full Arabic experience and have it with couscous. If you are a classical buff, set the mood with Rimsky-Korsakov’s "Scheherazade." If you prefer something more modern, explore the contemporary Middle Eastern-influenced music of artists such as SoapKills, Azam Ali, or Natacha Atlas (who does an incredible version of the Screamin' Jay Hawkins classic “I Put a Spell on You.”) Be sure to have some strong, sweet mint tea on hand for afterwards!